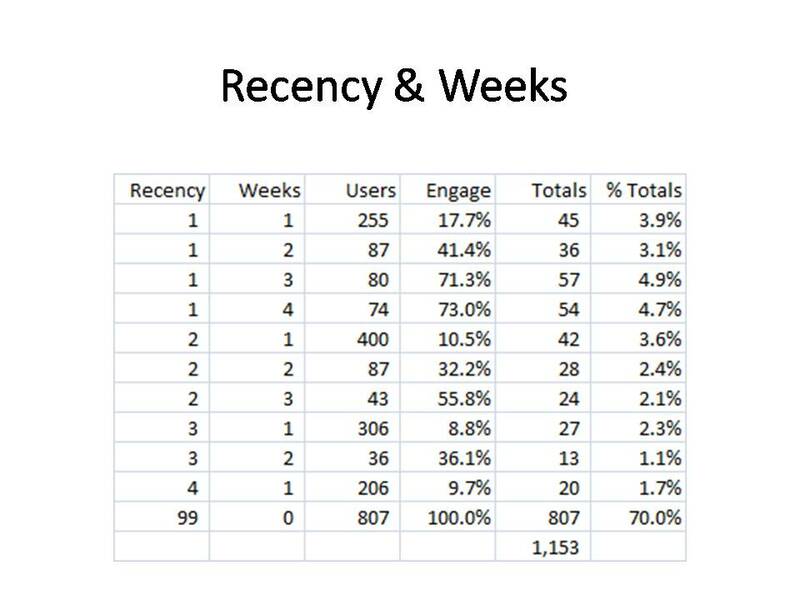 We continue our analysis of the #blogchat community by looking at a segmentation scheme that includes recency (weeks since last participation) and weeks (number of weeks participated during past four weeks). 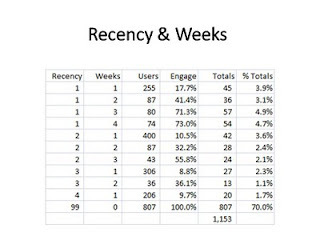 Last week, we looked at "Mega Participants", those with recency = 1 and weeks > 2. Their engagement rate (probability of participating next week) was about 70%. Now take a look at every row in the table where users only participated in one week. Well, you see low engagement rates, don't you? In other words, if the participant participates in only one week, regardless of recency, that person has a low chance of participating in the following week. So that's not a good thing (though #blogchat data is so directionally similar to what classic direct marketers see in their RFM analytics that it is frightening). What would any good direct marketer do when faced with an unresponsive audience? Yup, that's right, they'd mine the data for the subset of participants who do want to participate again. So we'll do that tomorrow!